launches the sixth edition of AICA Incentive Award for Young Art Critics. The previous winners have been Franck Hermann Ekra (Ivory Coast), Alessandra Simões Paiva(Brazil), Sebastian Baden (Germany), Lee Sun Young (South Korea) and Victor Wang (Canada/UK). awarded a round trip to attend the forthcoming AICA Congress in Taipei, Taiwan, and the Post Congress Trip to Taichung, Tainan, and Kaohsiung scheduled to take place from 14 to 21 November 2018. The critics coming second and third in the competition will also be eligible to receive an honorary mention. AICA reserves the right to publish the text of the winner and the two runners-up on its website. The composition of the jury will be announced on the AICA website in July. • Critics have to be 40 years or younger on 10 September 2018. • Their article or review must relate to contemporary art in the Asia Pacific region. • Last date for submissions: 10 September 2018.
the previously published text has appeared not earlier than 11 September 2016. • Texts may be no less than 2000 words or more than 5000 words in length. • Submissions must be sent in .doc, .docx or .pdf format. short biographical profile (no longer than 150 words). Beyond the Obvious Conference|Registration is open! Book your place now at Culture Action Europe´s Beyond the Obvious Conference in Timisoara, Romania 25-27 October, 2018. Register until 15 September and get your early bird fee! Our different ticket categories will fit all your needs. Code, algorithms and artificial intelligence complement the human condition, can solve problems, accelerate decision-making, and help complete complex tasks through self-learning processes. The framework in which these operate is often defined as a communication system that is universal, transparent, simple and accessible. However, algorithmic processes are inscribed in our infrastructures. And beyond the purely functional transmission and transformation of the data, they often work invisibly, shaping and influencing social, cultural, economical and political spheres and redefining our individual and common identities. This year’s Beyond the Obvious (BtO) Conference ctrl+shift HUMAN: Arts, Sciences and Technologies in Coded Societies will focus on that paradigm: between the fascination generated by the possibilities this hybrid and augmented condition brings, and the awareness of the new patterns that lead to redefinitions of creativity, disciplines, representation, globalization, production, labor… all within the framework of an increasing code dependence. We will also explore the environmental impacts of media content and data generation, storage and transfer. Algorithmic processes require ever-increasing infrastructures, supported by servers, putting pressure on available natural resources and on the environment where citizens and cultures develop. Approaching these issues recognizes the strategic importance of a wider outlook, beyond disciplinary silos, including arts, sciences, education and research. This provides enormous possibilities to cross knowledge and sectors. It includes discussions about policy intervention and funding – local, national and European –and about how to foster collaboration between different operators and institutions. We will bring together various experiences and practices from the fields of arts and culture, sciences, technologies, activisms, theory and politics, to explore possible cross-disciplinary answers and diverse actions towards the challenging relations between Technology and Humans. How to keep our humanity in this and find new forms of sense making in a post productive and global society? What are the new models in those relations, and which role does culture, the arts and education play? Are our institutions ready for it, aware of their new role? Which organizations and policies are needed to foster alternative, transsectorial and intercultural competences? See you all in Timisoara! Why to join Culture Action Europe? Copyright © 2018 Culture Action Europe, All rights reserved. You are receiving this email because you opted in at our website or have participated in one of the events organised by Culture Action Europe and expressed your interest to receive regular updates from us. 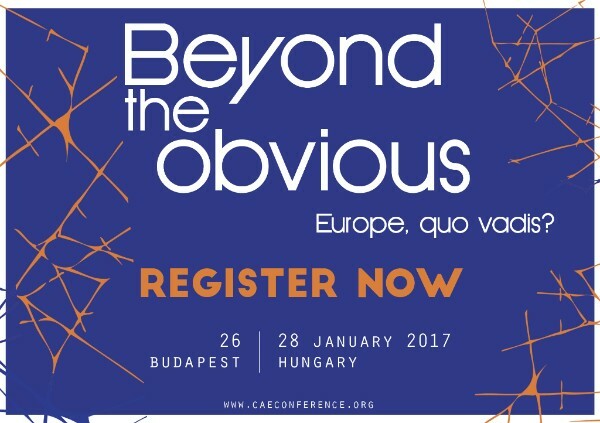 Culture Action Europe is delighted to invite you to our upcoming Beyond the Obvious Conference. 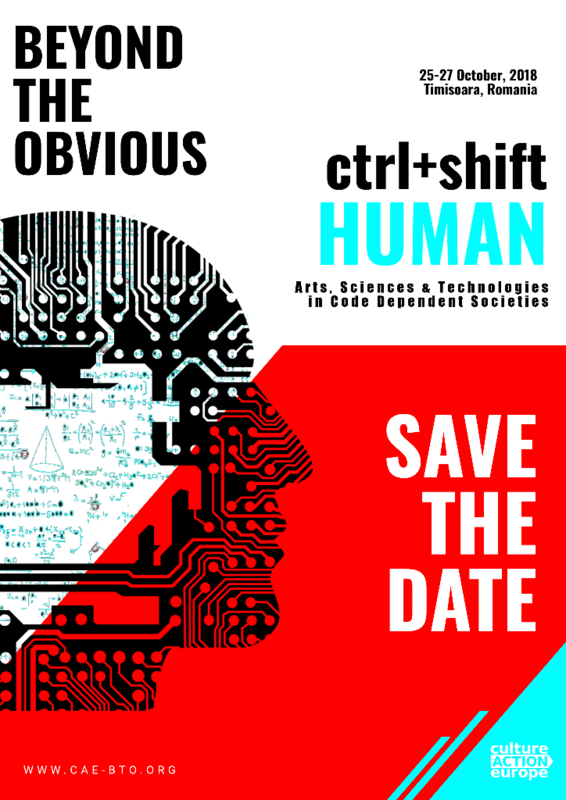 ctrl+shift HUMAN: Arts, Sciences and Technologies in Coded Societies will take place in Timisoara, Romania from 25 to 27 October, 2018. This will also include Culture Action Europe Members´ Forum and Annual General Meeting (open for members only). More information about the programme and registrations will follow soon. However, algorithmic processes are inscribed in our infrastructures and, beyond the purely functional transmission and transformation of the data, they often work invisibly, shaping and influencing social, cultural, economical and political spheres and redefining our individual and common identities. Beyond the Obvious (BtO) Conference 2018, entitled ctrl+shift HUMAN: Arts, Sciences and Technologies in Code Dependent Societies will focus on that paradigm: between the fascination generated by the possibilities of this hybrid and augmented condition bring, and the awareness of the new patterns that leads to redefinitions of creativity, disciplines, representation, globalization, production, labor within the framework of an increasing code dependence. We will look also into the environmental impacts of the cultural and media content and data generation, storage and transfer. Algorithmic processes require ever-increasing infrastructures, supported by networks of servers, putting pressure on available natural resources and on the physical environment where citizens, cultures and states develop. Approaching these issues means being able to recognize the strategic importance of creating a wider outlook beyond disciplinary silos, including arts, sciences, education, research, etc. that encourages the enormous possibilities of crossing knowledge and the mediation through sectors. That includes discussions of the levels of policy intervention and funding – local, national and European –how to build synergies between them and how to foster collaborations between different agents and institutions. For doing so, we will bring together various approaches, experiences and practices from the fields of arts and culture, sciences, technologies, activisms, theory and politics, to explore possible cross-disciplinary answers and diverse actions towards the challenging relations between Technology and Humans. How to keep our humanity in this and find new forms of sense making in a post productive and global society? What are the new models in those relations, and which role does culture, the arts and the education play? Are our institutions ready for it, aware of their new role? Which organizations and policies are needed to foster alternative, trans-sectorial and intercultural competences? TAGS: AI, Anthropocene, Algorithms, Cultural Policies, Data Harvesting, Data Forensics, Decision Making Processes, Identities, Media Competences, Posthumanism, Research, Science-Fiction, STEAM, STAD. Hello, this is a reminder from AICA Taiwan. We would like to kindly inform you the deadline of Call for Papers of 51st AICA International Congress is 31st of May, 2018. The detailed information of Call for Papers as follows. We are looking forward to receiving your works. Thank you very much. Ten years after the adoption of the Agenda for Culture in 2007, a new European reality calls for its urgent revision. There is a growing recognition by Member States and European institutions of the contribution of culture to the progress of the European Union. In times of accelerated economic and social change, culture can play an important role in overcoming common challenges and allowing Europe to stride into the future. In consultation with its members, Culture Action Europe published a reflection on a "Future-proofed Agenda for Culture". We thank our members who contributed their ideas in formation of this paper. A new Agenda for culture is only possible with sustainable and increased financial support for culture. Join Culture Action Europe´s 1% for Culture Campaign, sign and share widely our Manifesto. Support this campaign if you believe that culture is the foundation of European unity and key to future prosperity! It is with great pleasure to inform you about the ERPA International Congresses on Education 2018 that will be held in Istanbul / Turkey from 28 June to 1 July 2018 (www.erpacongress.com). We hope that the conference will enable you to share your research with an international research community and to engage in discussion about the current issues in the field of education. We want you to remember ERPA International Congresses on Education as a place where you discussed the issues and questions that count for your research, renewed relations with your colleagues and made contacts that helped you to develop new directions in your work. Congress languages are English and Turkish. While registering the ERPA International Congresses on Education 2018 you will be asked to choose the one that is related to your field of study. The main purpose in incorporating ten congresses within the scope of ERPA International Congresses on Education is to make the researchers aware of current trends in different fields, learn about the research conducted in different areas and help them discuss new trends and encourage interdisciplinary research. Therefore, the theme of the ERPA International Congresses on Education 2018 is “Interdisciplinary Research in Education”. Highlighting this theme does not mean underestimating or neglecting other important aspects of educational research and practice. The ERPA International Congresses on Education will publish an “e-book of abstracts with ISBN” and “e-book of full texts with ISBN”. Meanwhile, selected proceedings will be sent to the journal of SHS Web of Conferences for publication (if the authors request and pay the publication fee). ERPA 2015 and ERPA 2016 issues that are published in SHS Web of Conferences have already indexed in ISI Web of Knowledge. Meanwhile, ERPA 2014 issue that was published in the journal of Procedia - Social and Behavioral Sciences was also indexed in ISI Web of Knowledge. These proceedings should be well-written in terms of language use (the language of proceedings is English) and should be 5 to 8 pages in length. In addition, some selected proceedings can be referred for the publication in the journals that supporting the ERPA International Congresses on Education 2018. In that case the authors should obey the publishers’ rules. Thanks for your consideration and we look forward to meeting all of you in Istanbul / Turkey. How does one assess the success of an AICA Congress? Is this determined by the quality of the presentations? The number of the participants? The intellectual and emotional temperatures of the debates? The friendships established... Whichever criterion we choose to apply to our 50th Congress—it was a historic event, during which we managed to turn Paris into a vital stage for lively and highly stimulating discussions about art criticism and art, and the way both impact the world at large. By doing that, we remained truthful to our original mission: to build bridges among the artistic communities around the world and to foster artistic exchange. The list of organizations and individuals who turned our Congress into such a spectacular event is very long, and they will be acknowledged elsewhere in this Newsletter. I just would like to thank three colleagues with whom I worked closely on preparing the event in Paris in November: President of AICA France, Raphael Cuir, Secretary - General of AICA International Marjorie Allthorpe-Guyton, and Treasurer of AICA International Mathilde Roman. This is my final report as President of AICA. I would like to thank you all for giving me the opportunity to serve you for the last six years. This was an extraordinary period of my life—which began in Paraguay in 2011 and ended in Paris, where our association was established some seventy years ago. In AICA, I have been part of something bigger than myself and, as a result, I have learned about the vastness and richness of the world, and, also how complex our art world is—and that only by understanding those complexities can one make constructive changes. I wish all the best to the current President, Lisbeth Rebollo Gonçalves, for her tenure as the XVI th President of AICA International. I am very honored to receive the presidency from the hands of Marek Bartelik. He has done a wonderful job for AICA during his mandate. I want to pay homage to Marek Bartelik, President from 2011 to 2017. It is always a challenge to run an Association with the profile of AICA, where the cultural diversity is very rich and important to be recognized. I promise you to do my best. I want to take this opportunity to highlight the importance of the 50th Congress which took place last November in Paris. It will be, I´m sure, a reference in the history of AICA. I hope 2018 is a year of many realizations for our Association. I hope new projects begin and can be successful. Let´s work together! “How to cut off, fragments on judgement and art criticism” was the title of Georges Didi-Huberman’s fascinating lecture, certainly a peak in our 50th Congress, together with the closing ceremony at centre Georges Pompidou, celebrating Georges Didi-Huberman’s career as an inspiring art historian, when we presented him the AICA Prize he received from Régine Hatchondo (Managing Director of artistic creation) and Adriana Almada (Chair of Awards Committee, President of AICA Paraguay) – the appearance of Israel Galván was particularly magic. In-between, we had much intense, specific, wide ranging moments, from Gayatri Spivak’s opening lecture to the various round table, from visits to the Centre allemand d’histoire de l’art in Paris to exhibitions’ tour which led us to la maison rouge, Antoine de Galbert’s Foundation, the collection Société Générale, the Institut des Cultures d’Islam or the gallery Les filles du calvaire and more. We shared moments of listening, moments of debate, moments of discovery, moments of fun, celebrating six years of Marek Bartelik’s presidency, welcoming Lisbeth Rebollo Gonçalves as the new President of AICA. Each of us will have personal reasons to remember this 50th Congress, but I am sure all of us will remember it as a special time in the history of AICA. It would never have been such without our partners who all deserve to be thank warmly: Régine Hatchondo, Managing Director of artistic creation, Ministry of Culture, Éric de Chassey, Managing Director, INHA, Colette Barbier, Director of Fondation d’Entreprise Ricard, Stéphanie Chazalon, Managing Director of the Institut des Cultures d’Islam and Bérénice Saliou, Artistic and scientific Director of the Institut des Cultures d’Islam, Antoine de Galbert, fonder of the maison rouge, Aurélie Deplus, Manager of Société Générale artistic sponsorship, Thomas Kirchner, Director of Centre allemand d’histoire de l’art in Paris, Stéphane Magnan, Director of galerie Les filles du calvaires, Hélène Orain Managing Director, Palais de la Porte Dorée – Musée national de l’histoire de l’immigration and Stéphane Malfettes, in charge of cultural programmation at Palais de la Porte Dorée, Serges Lasvignes, President, Centre Georges Pompidou, and Bernard Blistène, Director of the Musée national d’art moderne as well as Jean-Max Colard, Responsible for "Service de la parole du DDC" of Centre Pompidou, José Manuel Albares Bueno, Conseiller culturel de l’Office Culturel de l’Ambassade d’Espagne en France, Bénédicte Alliot, Director, Cité internationale des arts, Catherine Bédard, Adjunct-Director, Centre culturel canadien Paris, Yves Robert, Director, Centre National des Arts Plastiques, Nathalie Giraudeau, Director, Centre Photographique d’Ile-de-France, Ann Stouvenel, Responsible for Visual Art, Mains d’Œuvres, Camille Blanc, President of Amnesty International France, Catherine Botton, Responsible for Communication and Partnership, Nespresso. Last, but not least, a special thanks to Secretary - General of AICA International Marjorie Allthorpe-Guyton, Treasurer of AICA International Mathilde Roman, and the AICA team Célia Bricogne (AICA France), Nathalie Rousselle (AICA International) assisted by Paula Caredda and our webmaster Alma Saladin. The following three days of lectures and panels addressed AICA’s significant early history and current issues, opening with an inspirational key note at the Institute of Art History by Gayatri Spivak who talked of language and of the subaltern and of her work as teacher with poor and marginalised communities in India. The many highlights included Fumio Nanjo, Director of the Mori Museum, Tokyo on the human and the necessity of art in an age of the cyborg and biotechnology, João Ribas, of the Serralves Museum, who gave a powerful argument for the necessity of the public life of art and images under threat from private interests and political censorship. AICAUK’s Sarah Wilson presented an enthralling gallop through her rich encounters and experiences through AICA and of the life-changing Congress she attended in Moscow and Tblisi in 1989. The last day of the symposia, "Everywhere and Nowhere" was held at the extraordinary Musée de La Porte Doreé de l’ Histoire de l’Immigration, a building of art deco splendour, the façade and interior adorned with reliefs and paintings of exotic images of empire. This was perhaps the most focused day, addressing the impact of migration on contemporary art; from Kim Levin (US) who gave a timely warning on the distinction to be made between empathy and exploitation, to Beral Madra (Turkey) on Vilém Flusser’s thinking on national identity and the migrant. AICAUK’s Paul O’Kane celebrated the art of translation as a means of migration of ideas through his work on the writings of the South Korean critic Lee Yil, shortly to be published by AICA and les presses du réel. Members later enjoyed a very convivial Moroccan dinner at Paris’ Institut des Culture d’Islam which has a suite of exhibition galleries, a prayer room and a hamman in the basement. The tour de force of the Congress was unquestionably the key note of George Didi-Huberman, philosopher, writer and artist, who spoke eloquently and with great clarity on "How to cut? Fragments on judgment and art criticism?". Didi-Huberman received the AICA International Award for distinguished contribution to art criticism at the closing ceremony at the Pompidou. He was also presented with a surprise performance by the outstanding flamenco dancer Israel Galván de los Reyes´. In the context of the 50th congress of AICA, it seemed important to address an issue both historical and current: the impact of migration on contemporary art. The call for papers attracted thirty four proposals worldwide, and the eight selected speakers gave diverse and in depth perspectives on a complex topic. Kim Levin recalled the optimism of the 1991 congress she organized, in contrast to the much more pessimistic global reality we face now, as political and ecological changes worsen. Confronting this reality, artists, critics and curators are fighting the terror of the past- and the future. The memory of Walter Benjamin or Willem Flusser was often invoked in the discussion. Speakers addressed these global issues through the specificities of geographical contexts, such as Sophie Ravion d´Ingianni on the Caribbean; on the situations in Colombia or Turkey and their impacts on lives and art, analysed respectively by Paolo Camargo Gonzalez and Beral Madra. In these political contexts, art has a therapeutic dimension, as Marek Wasilewski argued in discussing the work of the Slavs and Tatars. In the day´s plenary discussions strong individual experiences contributed to historical and theoretical approaches, as migration impacts on all our lives. The Palais de la Portée Dorée, Musée National de l´Immigration, was a very interesting context for this day. Warm thanks to our colleagues Nathalie Rousselle, AICA Office, to Alma Saladin, Programme assistant, to our intern Paula Caredda and Célia Bricogne, AICA France, all who gave tremendous administrative support throughout: AICA meetings, the Elections and the Congress symposia. The closing ceremony of the 50th AICA Congress, at the Pompidou Centre, was very special. After a brilliant presentation of Georges Didi-Huberman’s work by Raphael Cuir, President of AICA France, I had the honour to present, as Chair of the Awards Committee and with Régine Hatchondo, representative of the French Ministry of Culture, the AICA Award for Distinguished Contribution to Art Criticism to the French philosopher, art historian, writer and curator. The Award is given for lifetime achievement to an outstanding art critic from the country that organizes the Congress in a given year. Georges Didi-Huberman’s ideas and reflections on the status of images, expressed in his books and exhibitions, have offered a new perspective on art history and contributed to shaping contemporary artistic and curatorial practices in many parts of the world. In a moving speech he acknowledged the Award and, as a special gift to him, he was presented with a memorable performance by the renowned flamenco dancer Israel Galván. It was followed by an enlightening conversation between Georges Didi-Huberman and the curator and critic, Robert Storr. Previous recipients of the AICA Award for Distinguished Contribution to Art Criticism were Ticio Escobar (Paraguay, 2011), Annemarie Monteuil (Switzerland, 2012), Tomáš Štrauss (Slovakia, 2013), Lee Yil (South Korea, 2014), Sarah Wilson (United Kingdom, 2015), and Adelaida de Juan (Cuba, 2016). The AICA Awards Committee also offers the AICA Incentive Prize for Young Critics, and the winner receives an invitation to attend the AICA Congress. Details of the next Award will be announced in advance of the next Congress. While culture is a cohesive force, cultural divides are constructed to satisfy simplified political rhetoric. How can we, as artists and cultural operators, engaged citizens and policy makers, rationalists and visionaries, develop an inclusive belonging? What is the impact of civic participation on social cohesion? How can we on all levels - local, national and European - create an understanding of belonging based on diversity and inclusion? Our cultural heritage - both tangible and intangible - links us in Europe. The memories of our joint heritage, which we transmit from one generation to the next, shapemany facets of our identities. Yet what impact do these narratives have on European cultural and political identity, on inclusion and openness? Contemporary artistic creation can be a driving force to develop new narratives, new images for possible futures. A strong cultural Europe needs informed and involved citizens and calls for social innovation and inspiring political models. This informed engagement is rooted in education in the large sense of the term, allowing for the development of creativity and curiosity, and reaching out to people of all ages in an evolving society. Such an active ‘becoming’ must be co-created by all citizens, and take the global context into account. his Beyond the Obvious conference reviews the dynamics sketched and offers a concrete arena for productive interaction between artists, cultural operators, policy makers and political visionaries, economic and social stakeholders. It also celebrates the launch of the European Year for Cultural Heritage 2018. The conference will highlight policy issues at stake, developing a present and future of culture in Europe. The invitation by Rome, a city gifted by rich cultural heritage, will constitute an inspiring backdrop and example. Its commitment to create a sustainable contemporary space for its citizens will enrich debates. The Palazzo delle Esposizioni, in the heart of the city, will be home to the conference for 3 days, itself a vibrant example of contemporary renewal. The conference will host the CAE Annual General meeting and Members’ Forum. Synergies will be developed with parallel partner events hosted in the same venue by the British Council Italy on Education, Science and the Arts as well as the initiative "Lungomare Mediterraneo" by the Embassy of Croatia. The Reflection Paper "Belonging and Becoming: A cultural response to the White Paper on the Future of Europe and the accompanying reflection papers" proposes a first answer to this question, reflecting the voices of over 500 cultural players throughout Europe. Register before 23 December and get your early bird fee! Our different ticket categories will fit all your needs. People today are still living off the table scraps of the sixties. They are still being passed around -- the music and the ideas. The thought-provoking gathering of Culture Action Europe aims to look beyond the obvious. A prophetic task fitting our mandate in society. Every year since 2014 we update our definition of the obvious. What was unthinkable the year or even the Day Before, becomes the New Obvious. Our self-definition as a sector includes the task of sense-making, laying the foundations for shared cultural interpretations of our uncertain world. Much like a reluctant prophet before, we might prefer to reflect and think in a shade, ignoring the alarming signs of social, environmental and political tensions. The mission that unites us is to Act for Culture, to gather strength from each other in order to fulfil this calling. We will again provide an opportunity to share stories and experiences, to sketch scenarios, and build strategies. The 2017 Beyond the Obvious conference takes place by the Danube, in Budapest, in a venue named appropriately Balna (the Whale). We propose to take advantage of this location as a starting point to discuss the multiple challenges of the European project. Knowing that no obvious solutions exist, we need a deeper understanding of the cultural and historic viewpoints of the different European regions. After a decade of being in the EU, Central and Eastern Europe is culturally still terra incognita. Seriously underrepresented in EU cultural networks, Central and Eastern Europeans lack a voice and Europe as a whole lacks the lenses to understand the complex social and cultural developments that shape the region. << We wonder are the East-West socio-cultural dynamics fundamentally different? How meaningful is the North-South paradigm? We invite you to reflect, discuss and collectively embrace the issues that a composite Europe faces today. To prevent further fragmentation this cannot be postponed. European culture is not limited by borders. After the UK vote to leave the EU and at a time of rising global counterrevolution against cosmopolitism and globalisation, we need to urgently discuss how the cultural frameworks shaping our practices can benefit from the inclusion of cultural actors within and outside of political borders. While we search for effective ways to act on national and global level, we have great examples of culture-led social innovations from communities at a local level. We are inviting brave cities, piloting solutions on how to create inclusive, culturally sustainable localities. A special focus will be on sharing experiences of actors from past and future or aspiring European Capitals of Cultures. We need our collective creativity and visions to redefine the edges of culture. We cannot be blind to the signals pointing to the transformation of the global regime and the change of paradigm that it encompasses. Yet, the global changes happening are not limited to the domain of the political institutions. The digital data, information and communication revolution, the rapid transformation of work, the depletion of the biological and environmental base of our existence as a species, makes this great acceleration unpredictable. This is the context where we need to be bold enough to move beyond our conventional assumptions. The Whale will be a space to rethink culture, to explore its borders and edges. We look forward to welcome you in Budapest!